I purposely did not attach a recipe to my recent posting about meatballs because I kind of just wing it each time. In my mind everything is negotiable. I realize this is not the most helpful way to go about cooking so I simply neglected to put anything. However, this could be construed as somewhat cruel after making boosting comments about how good meatballs are and then not writing about how to make them. First things first, I am not opposed to buying frozen meatballs. Trader Joe's has a great variety of turkey meatballs. One bag is only about $4 and they are pretty good and super easy - just heat them up. But let's not lie, nothing is the same as homemade, so here is my best attempt at capturing my method for meatballs. *Pick your meat: Beef or Turkey, If opting for beef this is one of those times where less fat is a good thing. You don't want your meatballs floating away on grease. I use about a 1lb package. Throw together and mix with hand or spoon. I make about 1inch balls. I find the best, simplest, and easiest to clean up after method for meatballs is baking them. Foil a cookie sheet and bake in the oven at 375 degrees for about 20 minutes. Remember the time varies with the size of the balls. Now here are all of the cravats. The portions above are types of ratios. When I make the meatballs I don't really measure the bread crumbs or ketchup. There is a certain consistency you are trying go for - moist but solid in the squishy beef mixture solid way. You should get this feeling as you are mixing everything together. If all the ingredients are not coming together you need a bit more ketchup. If things feel a bit wet and you cannot form perfect round balls probably need a bit more bread crumbs. It sounds complicated but once you practice a couple of times you should know what I mean. I am confident within two attempts you should be golden. As mentioned above, baking is not the only method. Putting them in a heated skillet also works well but takes more hands on time. You cannot make them all at once and you must stand there turning them around in the pans. By baking you pop them in the oven for 20 minutes and walk away. Once you remove the meatballs from the pan you can throw the foil out and clean up is done. I have frozen the cooked meatballs as well, and they last for about 2 weeks. Just take out the night before you want to use them. You can also make them up Sunday night, they last for about 2 or 3 days in the refridgerator after they are baked. One of my favorite family meals is meatballs. My mom makes amazing meatballs. It is one of the special dinners we have whenever I come home. If I am super sweet, which most likely is yes. Or to be more honest my mom is being super sweet, which most definitely is yes, she will make extra to send home with me. For all of the time I spent growing up in the kitchen, for the longest time I didn't know how to make meatballs. Finally about a year ago I asked my mom to show me. Well, this was quite a task since I hate to handle raw meat. When I was young I wouldn't even touch the wrapped packages in the grocery store. Whoever decided to put the plastic bags in the meat department is a genius, but I digress. Making meatballs certainly requires grabbing raw meat and making the balls. I don't care how skillful you are to mixing the ingredients with a spoon there is absolutely no way to make the little meatballs with just grabbing the meat barehanded. Yuck is all I can say. I tend to hold my breath as I take this step. Regardless, the point of this post is not raw meat but meatballs. Commonly they are served on the side of pasta but I want you to consider another common way of serving meatballs. A meatball sub! Instead of waiting for the water to boil and then the pasta to cook simply buy some grinder rolls or a nice baguette at the store, heat/toast, and throw on the meatballs with some toast. Its simply, delicious, and filling. 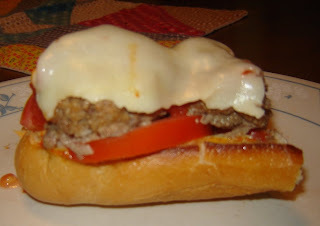 Meatball sub sandwiches are a perfect variation on an old favorite. The birthday celebration continues this week with my true birthday dinner. We drove down to Port Chester, NY to try the newest Mario Batali restaurant Tarry Lodge. Parking is a bit of an issue and using the valet services can be an easy way to save yourself some anxiety. The building itself looks like a big warehouse on the outside with a new coat of paint and a fancy sign. It sits nicely on a corner right off of Main street. We started the night off with a stop at the bar. Along with an extensive Italian wine list, Tarry Lodge has homemade fruit sodas and wonderful cocktails. We chose two of the cocktails. A little on the girlish side, the Tarry 75 mixes cognac with limoncello. It was delicious. The cocktails range from $5-$13. And are quite reasonable compared with the wine served by the glass from $10-$18. My suggestion would be to go for the bottle if you are interested in wine. We picked two Antipasti dishes: smoked trout and sweet peppers. The smoked trout was served as a salad with pieces of the trout mixed with heirloom tomatoes, rustic bread pieces, mozzarella, basil and green beans. The sweet peppers was simply a dish of roasted sweet peppers. And they were not joking about being sweet. I paired my with the bread they brought to the table. It was as good as dessert, or almost. The bread came with extra virgin olive oil with additional olives in it. There was an intense olive flavor to the oil. We opted out of a past dish and went straight for the Secondi course. Jordan got the skirt steak with tomato panzella. I got the lamb chops with roasted zucchini capota. The lamb was amazing but I could have done without the zucchini mixture. There was some sort of pepper included with a taste I did not care for and completely overwhelmed the flavor of the other veggies. We left before dessert. I honestly didn't see anything that jumped out at me on the menu and I was sufficiently full after the meal. Our reservation were early on a Saturday night but as we left the restaurant and bar area was filling up. I can see the whole place getting quite loud when busy. I would go back again for a lunch and try one of the tasty sounding pizza dishes they also serve. I thought since I was on the subject of birthdays and technically I am still celebrating I thought I would put out there a few of the things I have discover that make it really easy to have a week long birthday celebration. Its no secret I like to cook, eat, and shop. Somehow in the last two or three years my email address has gotten out to certain companies who now also know I like to cook, eat and shop. They also have gotten my birth date. Although annoying emails come into my inbox throughout the year, the week before my birthday makes the other 51 weeks of the year worth it. Here are some of the coupons I have gotten. A tradition for most Americans is a cake for a birthday celebration. This past week I turned 25. And no, even with prodding from friends I was not worried or agitated from now being a 1/4 of a century old. I enjoy birthdays; mine, yours, a complete strangers having a birthday means it is a special day. I tend to make plans for my special day that will stretch into weeks and this year months. Of course that is another posting on a non-food related blog. During my college years, 4 years in a row I got a cake from the Bakery House in Bryn Mawr, PA. They had divine cake and often when eating it I would overindulge. My sophomore year I ended up being employed by said bakery and was able to have cake much more often than on my birthday. I don't live in Bryn Mawr anymore so I don't get to enjoy the yummy vanilla chocolate chip cake on my birthday. 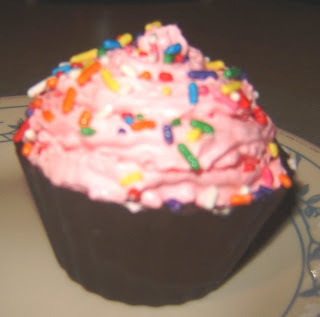 However this year one of my wishes was for the new ice cream cupcakes from Cold Stone creamery. They came out a few months ago and ever since I have wanted to try them. 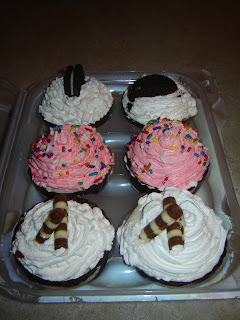 The cupcakes come in three flavors, Sweet cream, Double Chocolate devotion, and Cake Batter Delux. Now just imagine a chocolate cup filled with a layer of cake, a scoop of ice cream and topped with icing. Yum Yum Yum. I was under them impression when I made my request that in each six pack you could only have one flavor. I could not decide which flavor I wanted more in the days leading up to my big day and I left it to whatever my wish granter would pick. As you can see, he came through with 2 of each flavor - One of each for each of us. I have always been a very good sharer when it comes to food. I simply want to sample everything on the table. This little package allowed me three days of delicious deserts. Every night I got a new little treat to taste. It was the perfect serving size. Although a bit expensive for an everyday occurrence these little cupcakes are great for a single size serving on special occasions for anyone who likes ice cream. For more information on the different flavors go to Cold Stone Creamery website. The second and final stop for the food tour ( I was only gone for 1.5 days) was the Ben and Jerry's factory. They also provide a tour of the factory for $3 per adult. Ice cream and cheese are two of my favorites. Thus, I would have had a good time at both places even if the tours were not that great. I assure you though both were quite enjoyable. The tour at Ben and Jerry's starts with a video as well on the history of Ben and Jerry (the people, not the ice cream) and how the business got started. Those of you who follow my blog know that I recently got the Ben and Jerry's ice cream cookbook. The opening to this book is very similar. Needless to say I felt like quite the expert. Next comes the factory portion. For security purpose or so we were told no photos could be taken during this part of the tour. But essentially you are on a walkway above the processing floor with windows on both side. They play a video on the process as well as have the tour guide speak to the process. At each point of the production description a light on the corresponding machine illuminates. With my new found interest in ice cream production this huge process was very overwhelming to say the least. Clearly I will never be a multi-million dollar producer. Sadly, since it was labor day weekend there was no ice cream being made. Wouldn't it be wonderful if we all had large vats of cream, milk, and sugar outside our houses? The tour ends with sample of that day's ice cream. I got cookies and cream. Not to be disappointed it was delicious. Of course, it was only a small teaser and there is a Scoop shop outside to get a more hearty dose of ice cream. The Ben and Jerry's experience cannot be concluded until you take a walk through the retired flavors graveyard. Being from Maine I had to take a picture of the Makin' Whoopie Pie. It only lasted a year. Each sign as a clever saying as well as the explanation of the ice cream flavor. On a side note: Jordan decided after my first attempt at ice cream making with the ricotta cheese that he would suggest the flavor to Ben and Jerry's. He coined the title of Holy Cannoli. Amusingly at the grave yard he realized that the flavor had already come and gone. He is still fretting about his missed opportunity. Of course as with all of my trips and travel adventures, I researched way in advance where I would be at meal times and what was around to eat. It didn't take long to realize that Vermont was full of more than great restaurants. Vermont is home to Green Mountain coffee, Ben and Jerry's and Cabot creamery. Thus my itinerary took on a few select food locations for visiting. The first being Cabot Creamery in Cabot, Vermont. Don't ask me how the big tractor trail trucks go through the twisting rural Vermont highways. Cabot, Vermont is a little town about 20 minutes from Montpelier. You may know them for this cheese. But Cabot Creamery makes all sorts of dairy products including cream cheese, sour cream, butter, yogurt, and dips. At the factory they have all sorts of samples to try, even some varieties of cheeses that are only available at select Vermont locations. The Cabot Creamery factory tour cost a small $2 per adult. You watch a brief 10 minute video about the creamery and the dairy history of Vermont. Then you get a walking tour of the factory. You see the cheese making process as well as some packaging. It was very interesting and even during a holiday weekend they were making cheese. It was very fun and exciting. Below are some of cheese making views you see on the tour. Obviously there is glass between you and the actual factory floor but the workers come in and out of the rooms during the tour and you feel right in the middle of the action. I have been a long time Cabot cheese fan. They operate as a Co-operative so many of their profits go straight to the farmers. If you can not visit the factory...I am assuming most people won't, go out and try some of the Vermont Cheddar. Fun fact: Cabot cheddar is naturally lactose free. The lactose is in the whey protein that comes out during the processing. Who knew cheese could be lactose free? One of the few things I enjoy about summer is the abundance of fresh fruit. I love to eat fruit, especially berries. My favorite place to get the fruit is right from the farm but the second best is at the local farmers market. Local is NOT the operative word for me. I will drive a good long ways to get a good farmers market. I tried to be "green" really, but for me it is about taste. 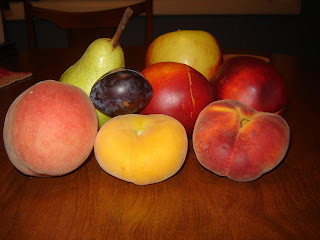 I will set aside my yearnings to limit my carbon footprint for a damn good piece of fruit. I must be honest and say that I have not been the most happy with the selection the Hudson Valley farmer markets. I mean everyone boost about it being so bountiful in the river valley. I have visited about 4 or 5 and found most have fewer than 10 vendors. I am a girl coming from Iowa where the weekly farmer's market goes on for blocks. The fruit above comes from the Hyde Park market which is held weekly on Saturday mornings. For you NY Times readers there was a recent article a few weeks back talking about the Hudson Valley markets and featured the Hyde Park one. After seeing this I was a bit infuriated. At this point I have lived in the area for about a year and 2 months. This is my second season for farmers markets. Last year twice I visit this so called farmers market on Saturday morning only to find an abandoned drive in movie lot with signs for this market. I clearly thought this whole thing was bogus after never seeing anything on my trips. Then out comes the article with true proof - pictures of Hyde Park farmer's market, people and food included. Well, off I went on my hunt for my own proof that the Hyde Park farmer's market existed. Of course, it was there and I have yet to find reasoning for why last year it was never open when I tried to come. I cannot complain anymore though. Although small, there was delicious fruit to be had, a wine vendor, cheese, and even a BBQ food cart.